Scott has been my super web master for many years. He’s smart, kind, generous and I trust him. Recently I asked him to share his knowledge about cell phones with my readers of Lean In With Linda. You’ll want to take notes. THE average person upgrades their cell phone every 18 months. 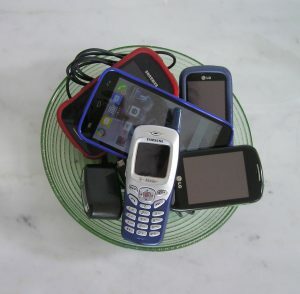 Many people choose to sell their old phone or drop it off with their cell phone carrier to be recycled. What many people do not realize is that a lot of personal information is on your phone and considering how often we hear on the news about the problems of identiity theft, it’s best to be certain your phone is wiped clean before being sold or recycled. It’s often incorrectly assumed that you don’t need to clear out a phone that is being recycled. You might imagine that it just goes into a big machine to be broken apart. What actually happens is they are sent to facilities where the phones are tested and sorted then re-sold to refurbishers who then resell them to individuals who are looking for used phones at a discounted price. Only the phones that are absolutely 100% non-functional actually get broken down and recycled. Some companies have very strict procedures to shred memory and SIM cards and do a factory reset on the phones to wipe out any information and photos. But that takes a lot of time and manpower. We all know that any competitive business with thin margins could inevitably choose to cut corners and making sure your information is wiped off the phone may not be a priority for every company. After you have reset the phone, if it uses a SIM card (Verizon, Sprint and other CDMA phones do not use SIM cards) make sure you remove it. Most models have a little door on one side which can be popped open by inserting the small metal key that came with your phone, or use a simple paper clip. The location of the factory reset option can vary depending on the model and Android version. If your phone has a SD card for extra memory storage it’s a good idea to remove it. The reset process should erase everything from it but sometimes it does not. If your phone has a removable battery, the SD card is generally found near the battery compartment or sometimes there is a small door on the side of the phone. You can keep the SD card to put in your next phone or keep as a backup in case you need more storage for your photos and videos. You can expect to find a reset option in the settings menu somewhere. However, sometimes older phones require a passcode to reset the phone. If you didn’t set a custom code, the default passcode is usually 000000. Always double check to be sure the reset process cleared off your photos and phone numbers. If you can’t find a way to reset your phone, a quick Google search is often helpful and ifixit.com is an excellent resource. Just include the brand and model of your phone along with the phrase Factory Reset (e.g. LG400 factory reset) to get the most accurate search results.